Wow! My 100th post! It's taken me a few years to get here - but here it is! I figured I'd better make it a good one, so we're having a giveaway! When the school year begins, do you start with some sort of expectations around what it looks like to speak and listen in your classroom? I do! I'm sure you do too, whether you realize it or not. In the first few weeks of school, I'm constantly going over what it looks like to listen (to myself or other classmates) and to speak in my room. We talk about turning your body toward the speaker and practice doing this in a way where you can't hear your chair move. We also practice letting go of anything we might be holding quietly and putting our hands together (Whole Brain Teaching anyone?). When speaking, we talk about when you should stand up, when you can sit, and a clear, loud voice. See, I told you that you talked about this stuff. So do my colleagues. 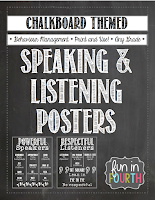 As a result, I've ended up making the same Powerful Speaker and Respectful Listener posters for 3 different classroom themes for myself and friends. They are all sold individually on TpT for a steal of a deal at $1.50. But, I promised a giveaway! 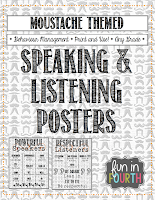 So, for the first 3 people who comment on this post with how they start their year in regards to speaking/listening they can have their choice of the 3 poster sets. Don't forget to leave your email address too. These file have hung up in our room all year long to serve as a daily reminder. They are great for when another adult is in your room too. Get commenting so you can have your own copy for free! 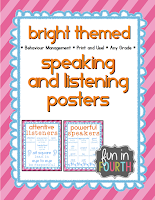 I am heading to grade 4 after a number of years in kindergarten, I am still deciding exactly how to tackle respectful listening and speaking but know that the foundation will be based on clear expectations that are consistently modelled and practiced. In Ontario, Canada students return Septmber 2, so I still have time time to determine my exact approach. That's a big change Tracey! You'll love grade 4. It's so much fun! It's nice to see another Canadian reader. I am in B.C., and if all goes well (we are on strike) I'm back the same day as you. Anyhow, leave me your email address and which poster set you'd like and I'll send it your way. We had that situation 2 years ago where they tried to make it illegal for us to strike. Luckily, it didn't work in their favour. I didn't realize you had that issue. Your file is on the way!! First we discuss what good listeners look like. We create an anchor chart. Then we model what good listeners look like. Then I get someone to volunteer what a not so good listener looks like - they love doing this. Then we model what good listeners look like. It's all about consistency and model, model, model. Hi Lisa! I love doing role play too. Kids really love the non-example role plays hey? Leave me your email address and which poster set you'd like and I'll send it your way.